The Laneway Theatre has it’s official opening show on Saturday, September 16, and we are excited! After a week of preview shows the buzz is incredible with guests raving about the unique venue, the mind blowing show, and the comfortable seats! Reviewers from The Plus Ones described the experience as “Pure Magic will have your jaw on the ground and your mind in knots as you witness the unexpected and the incomprehensible in a unique setting created to celebrate magic.” (Read the full review here). followed by a full two-page spread on Saturday saying “Starting with some elastic band tricks, Ellis is soon piling one mind-bending trick on top of another.” (Click here to see the story) or look below. You can tune in to ABC Breakfast Radio tomorrow (Monday) morning and hear Tim interviewed about The Laneway Theatre – and you can CLICK HERE to book your tickets to shows starting on September 16. TIM Ellis is hiding a secret in plain sight. That comes as no surprise to anyone who loves magic. Ellis is a master magician after all — a superior sleight-of-hand artist who preserves the tricks of his trade with almost scholarly passion. But after three decades of suspending disbelief and making things disappear, including himself, Ellis has conjured up something that really flouts reality: a magic theatre inside his house. 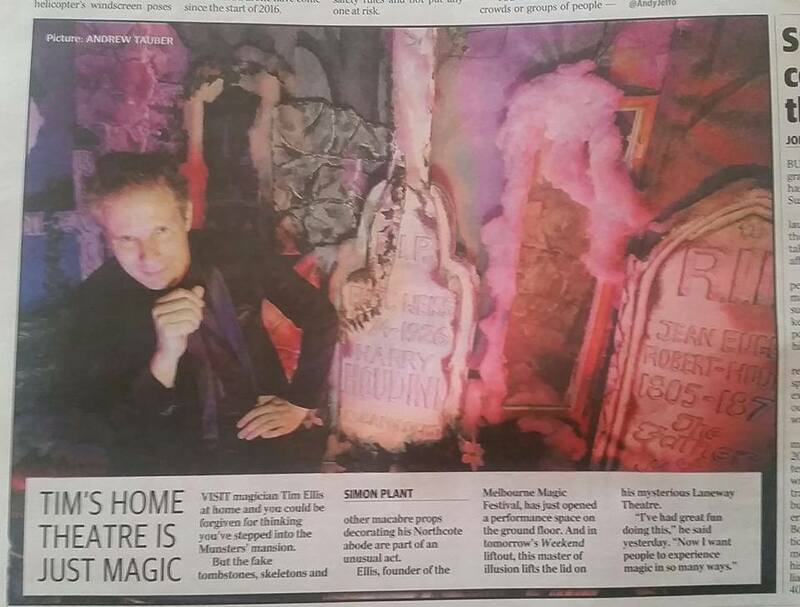 Ellis calls it The Laneway Theatre, Australia’s only purpose-built space for close-up magic. “Secret location” details are only issued when bookings are made. But this hugely talented trickster — who once escaped from a box dunked into the Yarra River — is not inclined to share his dream without putting visitors through a few hoops. First, you have to find his laneway buried deep in suburban Northcote. Then pinpoint the building. Carved out of an old broom factory, it has no discernible signage. Just a buzzer. “Push the door, hard,’’ a Lurch-like voice intones. So you do … and as it closes creakily behind you, enclosing everything in semi-darkness, macabre objects swim into view. Over here, a set of tombstones. Over there, a spotlit crypt. And a skeleton up ahead. “Like our spooky entrance?’’ Ellis asks, looming up ahead through a coffin-shaped door. I tell him it’s like stumbling into The Munsters mansion on Mockingbird Lane. ELLIS is not really a ghoulish guy. In his smoking jacket and black slacks, he’s more Noel Coward than Deadly Earnest. But the Ghost Train props leading into his home theatre are part of a bigger game of manipulation. “Surprise is the thing you have to do every time in magic,’’ Ellis says. And surprises keep coming as you venture further in. In the reception room, where he sells lollies and soft drinks, Ellis has a crash dummy squashed by a trunk while the Merlin Room is furnished with a flying broomstick and infinity mirror. There’s a two-way mirror as well — where performers can see you but you can’t see them — but I’m sworn to secrecy. The theatre itself — originally a practice studio — resembles a Gold Class cinema. No surprise there. The plush red seats once graced a Hoyts in Greensborough. Ellis bought the chairs online, got a carpenter to install them on tiered benches and now has room for 32 people. BEFORE the show, Ellis guides me upstairs to his private apartment. It’s a cool bachelor pad with zebra-striped couches, bar stools and a balcony where pet lorikeets flap around at will. But the nerve centre of his magic house is a “secret room” where Ellis test-drives his tricks. An animatronic monkey sits on one shelf. Freddy Krueger’s claws sit on another. Nearby are hundreds of boxes containing fake flowers and twisty ropes, puzzle boxes and buzzers, silk handkerchiefs and fake razor blades. “Performing is what I do,’’ he says. Ellis, who once ran Bernard’s Magic Shop in the city, knows the history, literature and theory of the magic arts inside out and his collection of books, posters, playbills and other ephemera functions as an active research library. Incredible to think that it all started with a rudimentary Hanky Panky Magic Set. “Timothy Ellis — Magician” was soon in demand for birthday parties. Then nightclubs. “Back in the ’80s,’’ he recalls, “I’d wear this ridiculous costume — like something out of Cats, the musical — and walk up to people, taking the cigarettes out of their mouths. “I knew they wanted to punch me but when I made the cigarettes vanish or turned them into something else, they’d change and say, ‘Hey, check this guy out’. In 1989, Ellis added escapology to his repertoire. Harry Houdini, the 19th century illusionist, is a personal hero — memorialised on one of those tombstones by the front door — and being lowered into the Yarra off Princes Bridge, in a padlocked trunk, was his “Houdini moment”. “The murk of the river, the water lapping my lips … I remember everything about it,’’ he says. Ellis made headlines for a day but hopes the stunt would earn him David Copperfield-like fame vanished in a puff of smoke. Magic, he discovered, is a hard slog. Still is. The Melbourne Magic Festival, which he founded in 2008, enjoyed record sales this year — 7000 tickets were sold for 65 different shows in half a dozen venues over 13 days. But Ellis, president of the Australian Institute of Magic, still struggles to secure corporate Support or government funding. Lately, Ellis has been working cruise ships — it pays the bills — but The Laneway Theatre is his great white hope for magic in Melbourne: a comfortable, well-resourced site where Ellis and guest artists can unleash their abracadabra. IT’S showtime. Sceptically friendly backstage, Ellis is now all smiles as guests press the buzzer, stumble through his graveyard and enter — wide-eyed — into his magic circle. “Make yourself at home,’’ he says. So they do. The audience — a mixture of family and friends, fellow magicians and curious neighbours — wander through rooms and enjoy historic magic movie footage before Ellis saunters in: the star of the show. The stage looks simple enough — a low table set with playing cards in front of a blood-red curtain — but starting slowly with some elastic band tricks, Ellis is soon piling one mind-bending trick on top of another. Wristwatches are magically adjusted, dollar bills are snipped in half, then stitched together. And any number of cards surface in unexpected places. To heighten the transparency, Ellis rolls up his sleeves. For his finale, Ellis dons a leather jacket, switches on a jukebox and turns a classic cup and ball trick into a neat piece of rock ’n’ roll theatre. Is it strange taking a bow in his own house?